with OLEG KOZLOVSKY, winner of the 2010 Ion Ratiu Democracy Award Thursday 2 December 2010, 14.00 to 15.30, and 16.00 to 18.00 Fifth Floor conference room, Woodrow Wilson Center, One Woodrow Wilson Plaza, 1300 Pennsylvania Ave., NW, Washington, DC 20004 TThe event was broadcasted live on the internet via Woodrow Wilson Center�s On Demand Service, 14.00-18.00 US East Coast Time (19.00-23.00 UK time). See more details here. You can also see the video trailer of this event via YouTube. Russian democracy campaigner Oleg Kozlovsky received the 2010 Ion Ratiu Democracy Award on Thursday, 2 December 2010, as part of a two-panel workshop featuring the round-table discussion After the �Reset�: US and European Approaches to Russia and the keynote address Democracy: New Tools for the Struggle. Panel I: After the �Reset�: US and European Approaches to Russia, 14.00 to 15.30 Round-table discussion with Ambassador Kurt Volker, managing director and senior fellow, Center for Transatlantic Relations, SAIS , and former US ambassador to NATO, Angela Stent, director, Center for Eurasian, Russian & East European Studies, Georgetown University, and Oleg Kozlovsky. To RSVP, please e-mail: ionratiu-lecture@wilsoncenter.org . Panel II: Democracy: New Tools for the Struggle, 16.00 to 18.00 Oleg Kozlovsky, recipient of the 6th Annual Ion Ratiu Democracy Award, will deliver this year�s keynote address. Comments will be provided by Daniel B. Baer, Deputy Assistant Secretary for Democracy, Human Rights, and Labor, Department of State, Robert Guerra, project director, Internet Freedom, Freedom House, and Saad Eddin Ibrahim, Egyptian democracy activist and 2006 Recipient of the Ion Ratiu Award. To RSVP, please e-mail: ionratiu-lecture@wilsoncenter.org . While in Washington DC, Oleg Kozlovsky also spoke at the World Youth Democracy Forum for DC-Area Students, at the George Washington University. See details here. Oleg Kozlovsky is the Co-Founder of the Solidarnost United Democratic Movement and also a Co-Founder of Oborona, a democratic youth movement in Russia. Oleg was the organiser of many nonviolent actions and rallies in defence of democracy and human rights in Russia, Belarus, Ukraine, and Moldova. He has been arrested and detained multiple times for this, and even conscripted illegally into the army, released only after an international civic campaign of support. During his latest detention in May 2008, Oleg was recognized as a prisoner of conscience by Amnesty International and was fully acquitted after serving the sentence. Currently, Oleg is the Executive Director of Vision of Tomorrow Foundation and an analyst with the Anti-Corruption Policy Lab at the Higher School of Economics in Moscow. The purpose of the Ion Ratiu Democracy Award is to bring visibility and international recognition to the ideas and accomplishments of individuals around the world who are working on behalf of democracy. The event expresses the deep commitment to democracy of the late Ion Ratiu through his contributions as a Romanian politician as well as his interest in democratic change worldwide. Ion Ratiu (1917�2000), a Romanian democracy campaigner, journalist, broadcaster and author, was the most outspoken and consistent voice of opposition to Nicolae Ceausescu, whose regime he opposed for years from London as the democratically elected leader of the World Union of Free Romanians. After fifty years in exile he returned to his homeland in 1990 to contest the presidency. Although he won a seat in Parliament, and was to serve his country for his last ten years, his failure to win the presidency was a disappointment to many. Even nowadays, on Romanian streets, Ion Ratiu is remembered fondly, often referred to as �the best president Romania never had�. The Ion Ratiu Democracy Award aims to replicate for campaigning democrats today, whether in exile from repressive regimes or representative of today�s emerging democracies, the life-changing experience in Washington DC of the Romanian democrat, Ion Ratiu, in the 1970s and 1980s. Now in its sixth year, past awardees include Sergio Aguayo (Mexico, 2005), Saad Eddin Ibrahim (Egypt, 2006), Anatoli Mikhailov (Belarus, 2007), Eleonora Cercavschi (Moldova, 2008), and Adam Michnik (Poland, 2009). The Woodrow Wilson International Center for Scholars is the national, living memorial honouring President Woodrow Wilson. In providing an essential link between the worlds of ideas and public policy, the Center addresses current and emerging challenges confronting the United States and the world. Details on www.wilsoncenter.org The Ion Ratiu Democracy Award is funded by the Ratiu Foundation. The Ratiu Foundation is a charitable organisation established in 1979 by the leading Romanian dissident and democracy campaigner, Ion Ratiu, and his wife Elisabeth Ratiu. The goals of the Foundation are to further education and research in the culture and history of Romania in particular, and also to stimulate and support civil society in its understanding and application of democracy and democratic principles the world over. Details on www.ratiufamilyfoundation.com Special Thanks The Ratiu Center for Democracy, Turda (Romania); Professor Eliot Sorel, MD, DLFAPA, Senior Advisor, IRDA at WWICS; Dr Cristina Bejan, Post-Doctoral Fellow at The Ion Ratiu Chair of Romanian Studies, Georgetown University, Washington DC. Photo courtesy of Oleg Kozlovsky Help us spread the word on the Ion Ratiu Democracy Award 2010: send this release in your network, join the event�s Facebook page, link or embed on your blog or website the YouTube trailer, or Tweet about it. 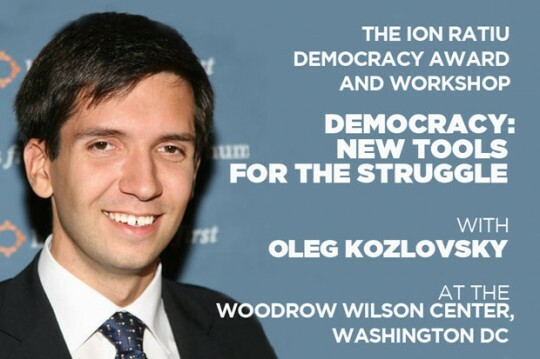 More about this year�s Ion Ratiu Democracy Award on Woodrow Wilson Center�s page of the event.